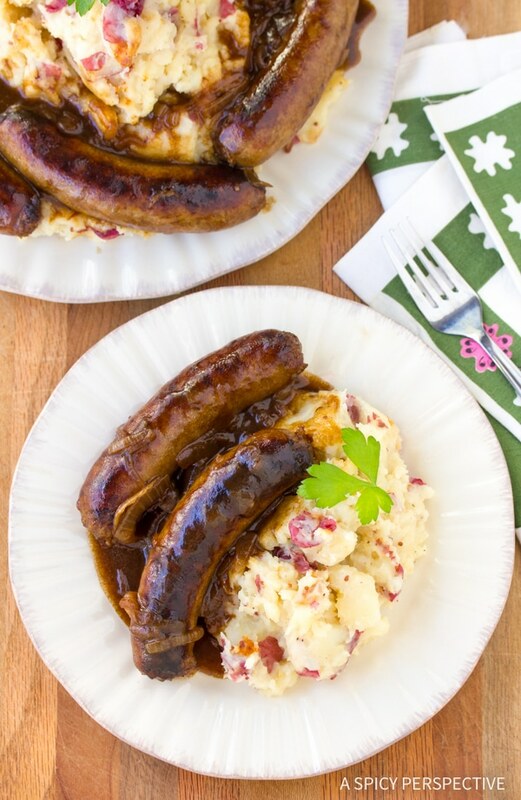 Classic cozy Bangers and Mash, just in time for Saint Patrick’s Day! Lt. Dan and I have a Saint Patrick’s Day tradition that we have kept over the last 17 years of marriage. We wear our Notre Dame sweat shirts (hubby’s a huge fan) and go to an Irish pub for lunch. I’ll be the first to admit it’s a corny little ritual, but we always look forward to it! 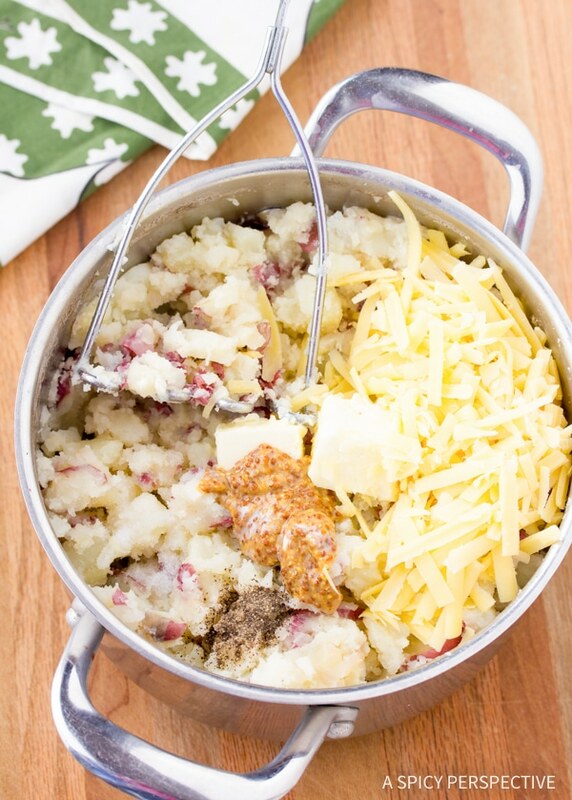 Irish food is often thought of a bland because the most common dishes are prominently potatoes and cabbage. Traditional Irish cuisine usually falls under two categories: farmer fair and pub grub. With humble roots, Irish dishes do tend to be simple, but can be quite flavorful and comforting. The most classic British Isle dish I can think of is Bangers and Mash, commonly served in both Ireland and England. It consists of pork sausage links and rustic “smashed” potatoes. 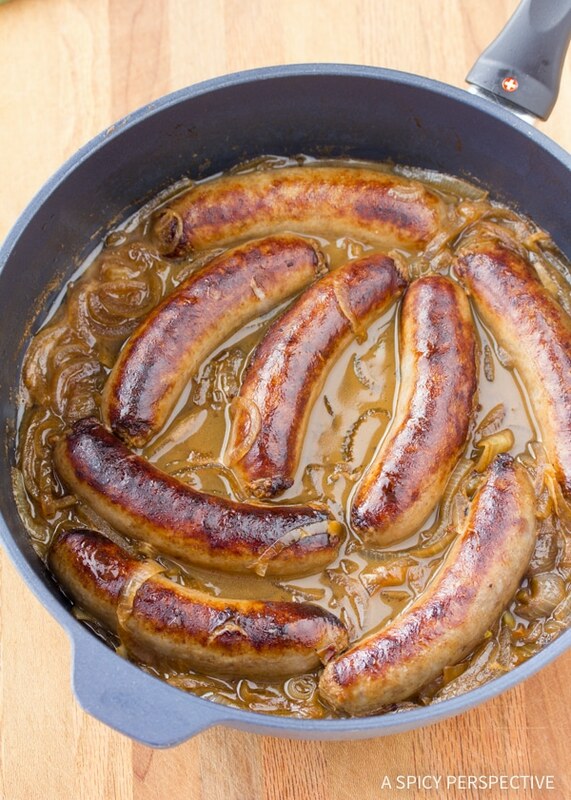 I like to pump up the flavor in my Bangers and Mash by boiling the bangers in beer and adding whole-grain mustard and dubliner cheese to the mash. For the beer, choose something you would drink because the gravy will have a concentrated beer flavor. 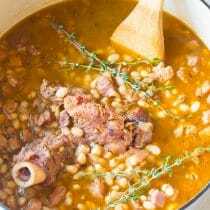 If you’re not a beer drinker, choose a light beer or substitute beef stock. Dubliner cheese melts smoothly and has bold flavor. It combines the sharpness of aged cheddar and the nutty essence of swiss or parmesan cheese. If you can’t find it, substitute any good melting cheese. If you’ve never tried making Bangers and Mash at home, this is the perfect recipe to start with. It’s simple to make, bold in flavor, and utterly comforting. 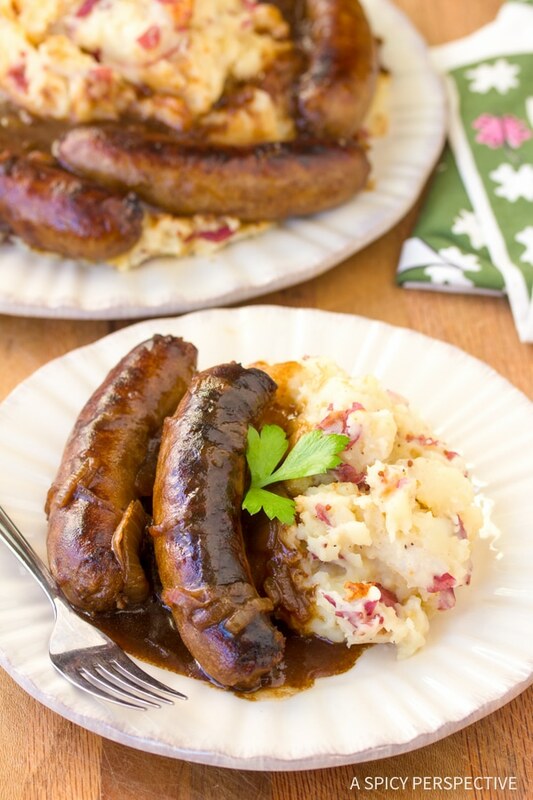 Hopefully Bangers and Mash will get your Irish eyes a’smiling! 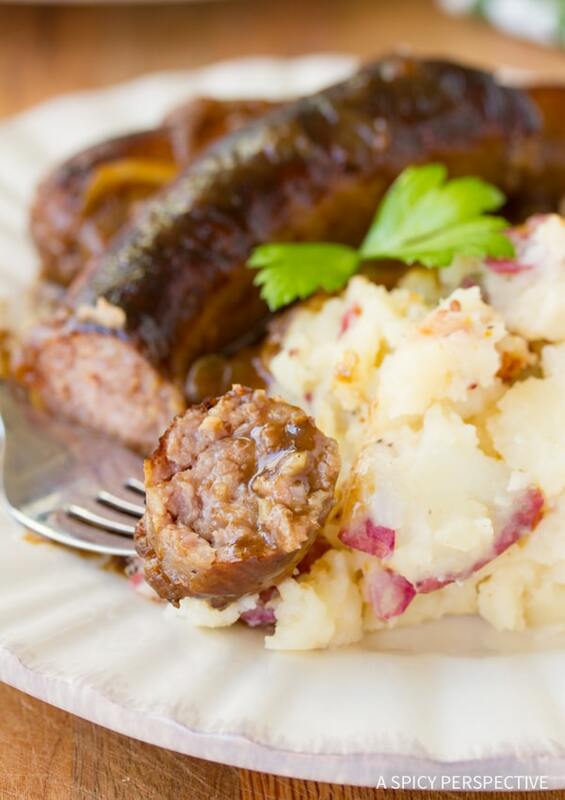 Savory authentic Bangers and Mash Recipe just like on the British Isles! 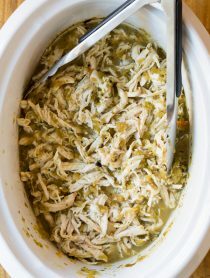 The simple recipe is perfect for Saint Patrick's Day. 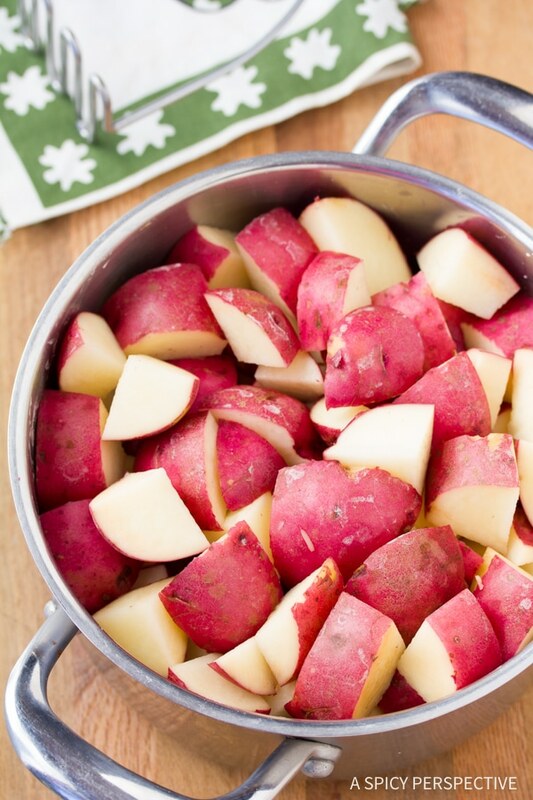 Chop the potatoes into large chunks and place in a pot. Fill the pot with water until it covers the potatoes. Add a large pinch of salt. Cover the pot and bring to a boil. Once boiling, remove the lid, lower the heat, and simmer another 10 minutes, until fork tender. Drain the potatoes and add the butter and milk. Smash the potatoes will a potato masher (or a large spoon or ladle). 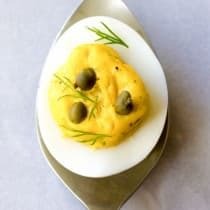 Once you’ve reached the desired rustic consistency, stir in the cheese and mustard. Salt and pepper to taste. While the potatoes are boiling, add 1 tablespoon of butter to a large skillet over medium-high heat. 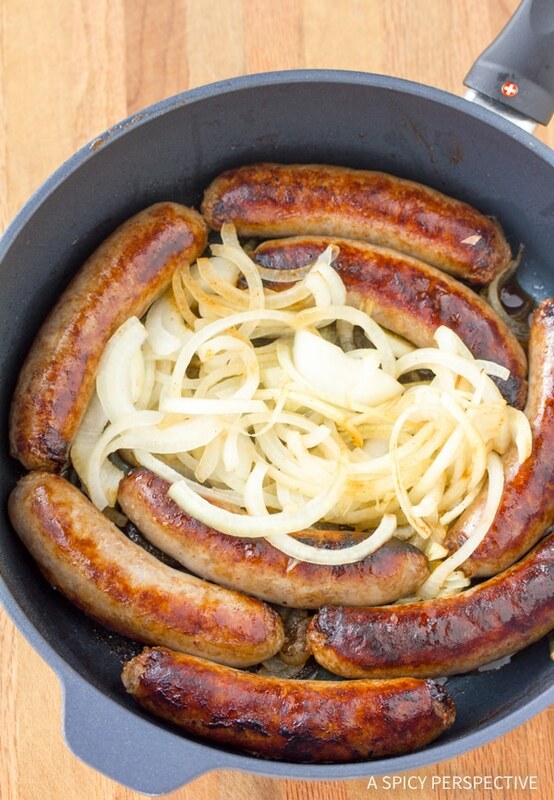 Place the sausages into the skillet, allowing them to make contact with the skillet first, then add the sliced onions. Brown the “bangers” and onions for about 10 minutes. Add the beer and allow it to reduce for another 10-12 minutes, stirring occasionally. Mix 1 tablespoon of soft butter with 1 tablespoon of flour together. Remove the bangers and mix the butter mixture into the beer reduction. It should thicken instantly. Now add the Worcestershire sauce and stock to thin out the gravy to your desired consistency. Salt and pepper to taste. Serve the bangers over the mash, topped with gravy. 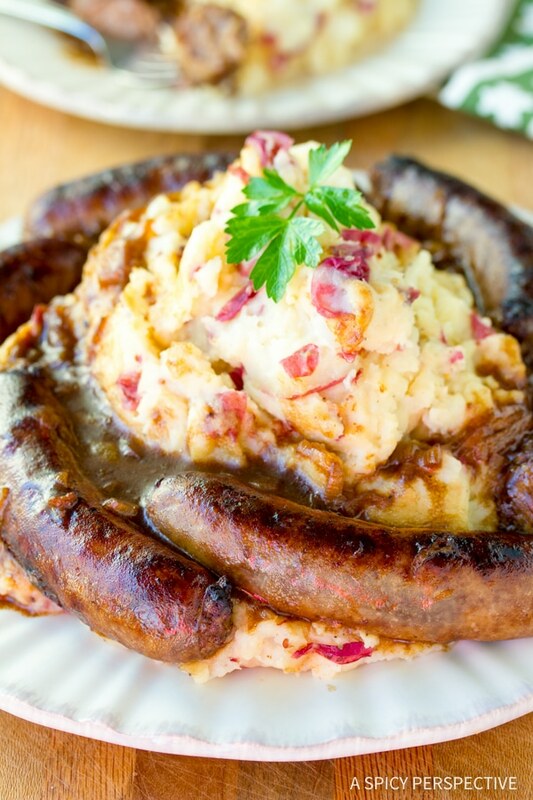 Bangers and mash are the DEFINITION of traditional comfort food, and I NEED it in my life asap! 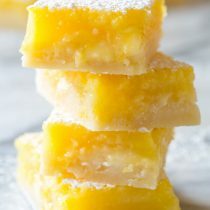 Another recipe that my picky husband loved. I add basil, rosemary, oregano and mushrooms to the onions as they cook, that simple change makes it DARN good! 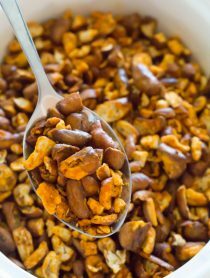 My personal secret ingredient is (don’t tell anybody now) a pinch of cinammon. It adds a je ne c’est quoi that is delicious! Oh my, this looks amazing! 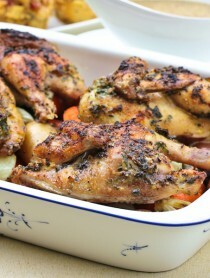 Recipe saved, and can’t wait to try this for dinner tomorrow! Bangers and Mash are not Irish. They are English. I made these for dinner tonight in honor of St. Patty’s Day. I’m not much of a cook, nor do I have an enlightened palate. But my family and I thought the gravy was really bitter and I wondered if that’s just the style, or if I did something wrong and ruined the gravy. Maybe it was my choice of sausage (though they were a Johnsonville Irish Garlic Sausage which tasted a lot like a Brat to me) or my choice of beer (Guinness Extra Stout – which I know nothing about because I’m not a beer drinker but it was Irish so I thought that was good) or if I burned it or something?? Regardless, the evening was delightful and I tried to make it a very Gaelic fest for my 6yo daughter who was very impressed with my efforts (we also made soda bread which was so awesome) and the fun Gaelic music from YouTube. Thanks for posting your recipe and experience. Your picture on Pinterest looked the yummiest of all of the Bangers & Mash recipes I scanned through. Also, as a fun side note, I grew up in Niles, Mi. Right outside of Notre Dame. You could see the Golden Dome from the upstairs window of my grandma’s house in the winter. Hey Heather, It might have been the beer. If you’re not a beer drinker, that might have come across as rather strong. Glad you still had a happy St. Paddy’s Day! My husband also found the gravy to be bitter. I’m not sure if it was the type of beer I used (an ale) but it didn’t go over well. Made this tonight. Family loved it. I did not use the beer, used beef stock. I will have to work on the mash, it seemed stiff, but I used more then the 2 pounds of potatoes. I wasn’t sure if I would like the mustard in the mash, but I enjoyed it. Its a keeper!!! Made this tonight and it was amazing!!! 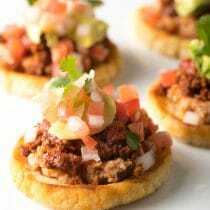 Great flavor and simple to prepare. Thanks!!! Pingback: What’s Cookin On St Patty’s Day?